The hottest days of the year often occur in August in Wales. Wild flowers are in their prime, wild fruits such as elderberry and blackberries ripen in the hedgerows. Butterflies are abundant and sometimes there is an explosion of ladybirds as different creatures enjoy the warm, sometimes sultry weather. August, rather surprisingly is on average the fourth wettest month of the year. 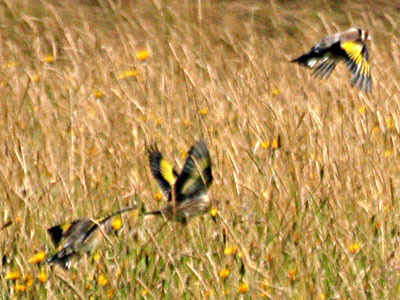 Undoubtedly one of the most delightful sights at Plas Farm during August is that of a charm of goldfinches, flitting through the swaying thistleheads, filling the air with liquid twittering. These beautiful birds are one of the most colourful native British birds. They love the sheltered mountain slopes behind the holiday cottages and may be located easily at this time of year. It has been said that if the month of August has a natural colour, it is purple. Certainly, many of the mountains around the farm become a blaze of purple as the heather begins to flower. Not wanting to be left out, the delightful Knapweed appears in the grazed meadows on the hillside behind the holiday cottages. 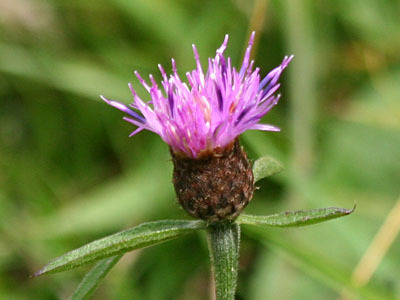 Knapweed is important as it is a favourite foodplant of many types of butterfly. Hazel trees can be found almost everywhere in Wales. There is one tree on the river bank outside Y Stabl holiday cottage and many others dotted about the farm. 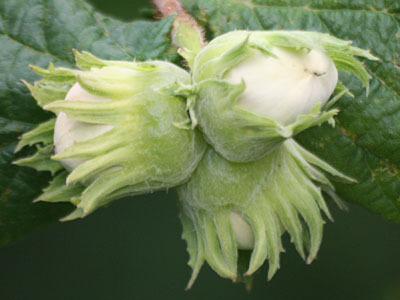 The nuts can be harvested and are delicious eaten fresh. You will need some stones to break into them though! 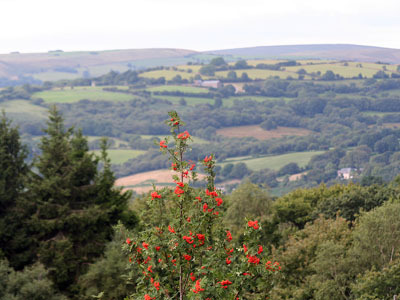 This picture shows a berry laden mountain ash in the foreground set against a backdrop of the western slopes of the Swansea Valley, between Pontardawe (Bridge over the quiet river) and Ynysmeudwy (Water meadow of the hermit). According to one 'mushrooming' website ".....one last treat awaits the forager. 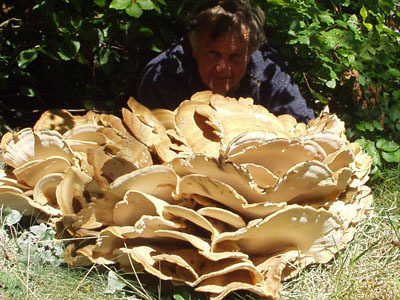 One last BIG treat because, if you're lucky, you may find a fruiting of Hen of the Woods as big as forty or fifty pounds." Well, this was taken outside Bwthyn Y Saer holiday cottage, at the foot of the huge beech tree. Nobody has dared to eat it yet but it seems that some people do. There are recipes out there! I chose this picture for the gallery because it had so much in it. Firstly, there is the small copper butterfly. 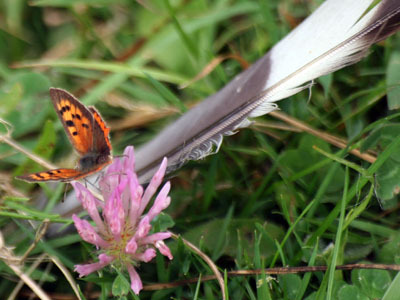 The small copper is usually seen in ones and twos. Males are territorial, often choosing a piece of bare ground or a stone on which to bask and await passing females. They behave aggressively towards any passing insects, returning to the same spot when the chase is over. Though it remains a widespread species, the small copper has declined throughout its range during the twentieth century. In the picture, it is feeding from red clover alongside which a magpie's feather lies. The crab apple, like the hazel and rowan, is a typical feature of the south Walian countryside. 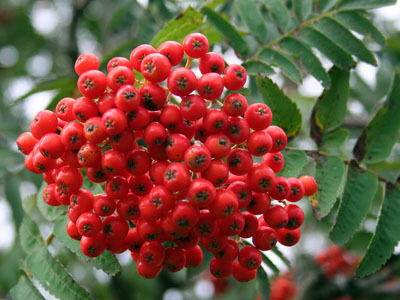 The attractive small fruit are extremely sour but make good jelly by themselves or with blackberries or rowan berries. Crab Apple wine is also very good albeit thunderously potent. In former times they were cultivated for animal fodder, especially for pigs, and some extant trees may have originated from this practice. 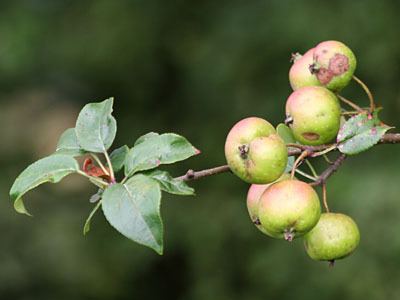 It may be that before orchard apples were perfected, wild crab apples were grown for food or cider making. Although the warmest days of the year are most likely to happen during August at Plas Farm, it also has a history of being a bit wetter than other summer months. 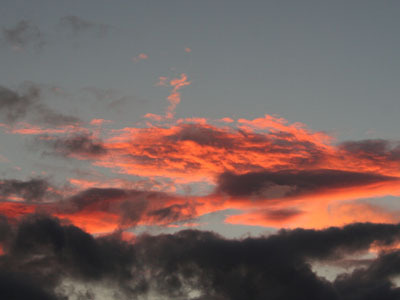 This does have its good points though - the sunsets can be very dramatic with varying shades of grey, orange and salmon filling the skies above the holiday cottages. The waterfalls are always good after a drop of liquid sunshine too!